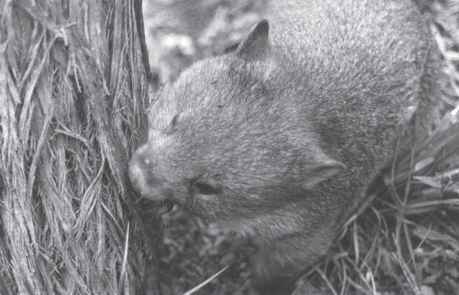 As well as postures and vocalisations, a wombat has other ways of communicating with others of its kind: by olfactory signals. The simplest of these, the scent emanating from the animal's body, probably allows individuals to recognise each other, particularly those sharing a home range. It is likely that they also recognise each other's scats and can distinguish them from those of a stranger to the area. Like most plant-eating animals, wombats produce large quantities of faecal material - on average, 80-100 individual scats in a night. As it wanders about its home range, a wombat leaves these scats, and hence its own particular smell, scattered all over the area. These scats then act as landmarks or as familiar, reassuring guides. It is noticeable that often 'new' objects will be marked with scats - a newly fallen branch, a dislodged stone, freshly disturbed ground, any article left about by campers, and so on. Where we use the sight of familiar objects to guide us, the wombat, with its apparently poor eyesight and nocturnal habits, relies on its highly developed sense of smell. By deliberately placing its scats on elevations such as sticks and stones, logs and tussocks, and any other prominent place it can find, it is almost certainly refreshing its own signposts, as well as ensuring that the smell is more noticeable: this not only will disseminate more widely but is also closer to nose height (Figure 5.16). Figure 5.16 Any additions to the bare-nosed wombat's landscape will be marked with scats, particularly objects that are slightly elevated, such as a fresh mushroom (left) or a fallen branch (right). some other surface, and this behaviour is called scent marking. It is generally used as a method of communication between animals. Since urine and faeces are so readily available, it is not surprising that they are frequently used as scent marking substances. Secretions are released from glands in the body into the urine and faeces before these are voided. The wombat has these glands located in the cloaca - the single posterior opening of the marsupial's body.